I get a lot of people staring at me as I stride into the sea, wearing waders, to collect a sample of water. Some ask what I’m up to and I’m proud to say that I’m gathering samples to check the quality of their bathing water. Whether the beach is packed with people sunbathing, or deserted in the pouring rain, we venture out in all weathers to gather data, which is then sent off and analysed. During the Bathing Water season (May to September), we need to collect regular samples all along the East Anglian coast. I generally work alone and cover the Essex coast, from Dovercourt to Mersea. I have a procedure to follow to take a representative sample; I wade in up to one metre and take the sample 30cm below the surface while always staying aware of any currents or adverse weather conditions. Once I’ve got my sample (and contrary to what people think, you can’t tell by the colour what the quality is like), I label it and record some field dets on a sheet, before placing it in a fridge at the back of my vehicle to keep the sample regulated between 2 and 8 degrees C.
I need to obtain 20 samples over the season, and these have to be done on different days and times to ensure data quality, including weekends and Bank Holidays. On an average day during the season, I’ll go to Dovercourt, Walton, Frinton, Holland on sea, Clacton, Jaywick, Brightlingsea and Mersea, so that is a lot of driving but at least I get plenty of opportunity to see what a beautiful county it is. At the end of my sampling day I head back to the office to drop them off in time for the courier’s arrival. The courier generally stops at our depot around 9pm and from there, travels to Exeter, where the samples are analysed by the lab for Intestinal Enterococci (IE) and Escherichia coli (E.Coli). The analysis process takes approximately 4 days to complete. When I’m not collecting bathing water samples, I am undertaking fish surveys and routine water quality work in rivers. I really enjoy my work as an Environment Monitoring Assistant. It is very varied and means I get a lot of interaction with the public. I know some people think I am lucky to spend much of my summer on beaches, but I have to tell them I am working and it’s not sunny the whole time! Across the country our staff take samples from more than 400 coastal and inland designated bathing waters to test how much bacterial pollution is present. We use the results to assist our work with the government, bathing water controllers and businesses to maintain and improve water quality at bathing waters. 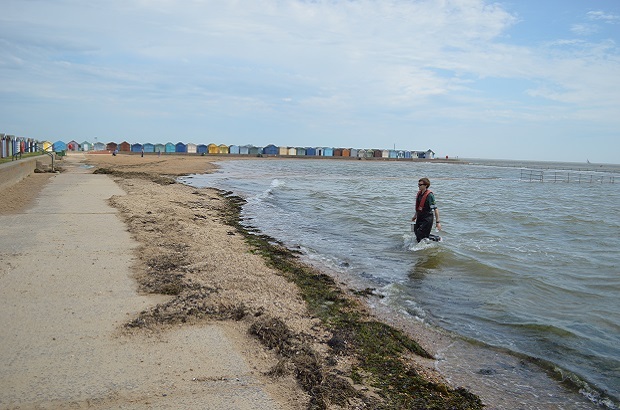 We are always encouraging home owners, beach users, businesses, water companies and local authorities to help improve their local bathing waters. We also work closely with organisations such as Marine Conservation Society and Surfers Against Sewage to see what more can be done. This year there is a new classification for bathing waters for all EU countries and the results, based on samples taken between 2012 and 2015, will be released in November.